This is why we fund NASA! “Geometrical figure composed of multiple evenly spaced, overlapping circles.” Or, in other words, “a flower-like pattern with the symmetrical structure of a hexagon” — consisting “of seven or more overlapping circles, in which the center of each circle is on the circumference of up to six surrounding circles of the same diameter”. — Wikipedia. Rejecting the New Age connotations, I wonder if there is something to your analog: could the “one” huge polar geometry be comprised of a myriad-complex of smaller geometry? — like the “Flower of Life”? Perhaps, somehow related to the Fractual concept. One big thing built from a geometry of smaller things. The pattern of clouds in relief (3D would animation would be fantastic) might hold tantalizing clues. Are scientists still stumped at how this forms and stays in that shape? Wikipedia’s page wasn’t very helpful. I don’t think so, that’s a very known fact of fluid dynamics, I studied it for my physics degree, read about Rayleigh-Bénard convection (“convective Bénard cells tend to approximate regular right hexagonal prisms, particularly in the absence of turbulence” – Wikipedia). There are lot’s of other differences, and you need more than just descending currents on poles to form cells. If this was a vortex lattice, then I would expect to see some sign of of the six satellite vortices on the other side of the vortex edges. I think you may have something like a Rossby wave, which in this case fits six periods around the pole, so it is nice and stable, but you could probably get a pentagon or a heptagon without upsetting things too much. This is probably not something that we could predict. After all, if it could be predicted then why isn’t there one at the other pole? I think it is probably a temporary atmospheric feature, though ‘temporary’ here would include other ‘temporary’ atmospheric phenomena such as Jupiter’s Great Red Spot. PS: I used to look at vortex lattices in superconductors ages ago. Very different fluids, but the maths has the same shapes. It could be that also. I’m just saying that hex’s are not that odd in fluid dynamics. We knew how they were formed back in the 50’s, because they also occur on earth. 891 MILLION miles from the sun,yet the big yellow light in the sky influences storms. Hmmmm.So the Sun is so powerful to affect climate on Saturn, yet can’t on a planet that is closer by a factor of 10? The Sun is the predominant source of energy across the Solar System. It even affects sublimation of surface ices on Pluto over the course of its orbit, much farther away than Saturn. 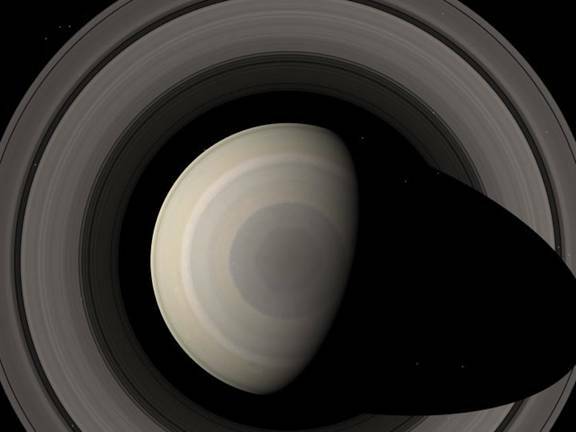 With Saturn’s 30-year-long orbit, even small net increases in solar energy in higher latitudes during the spring and summer are of course going to have an effect on weather activity – especially in the upper atmosphere. Ofcourse it is. That is my point. It IS the predominant source of energy (heat) in the solar system. To underestimate its effects on climate and weather HERE is to do it a serious disservice. Computer simulations! WooHoo! WOW!! Explain the hexagonal structure! This is too cool! Great Photographs! When we figure this out……. Maybe….. I will be curious until I join the cosmos and know. My concept of Heaven. Amazing! If I was writing a sci fi story this hexagon would enclose a flat world. Maybe it’s the Saturnian Pentagon. They had to one up us with a hexagon. There’s a couple of posts on LiveScience where researchers have created pentagonal and hexagonal standing waves – unfortunately they still don’t know the mechanism. 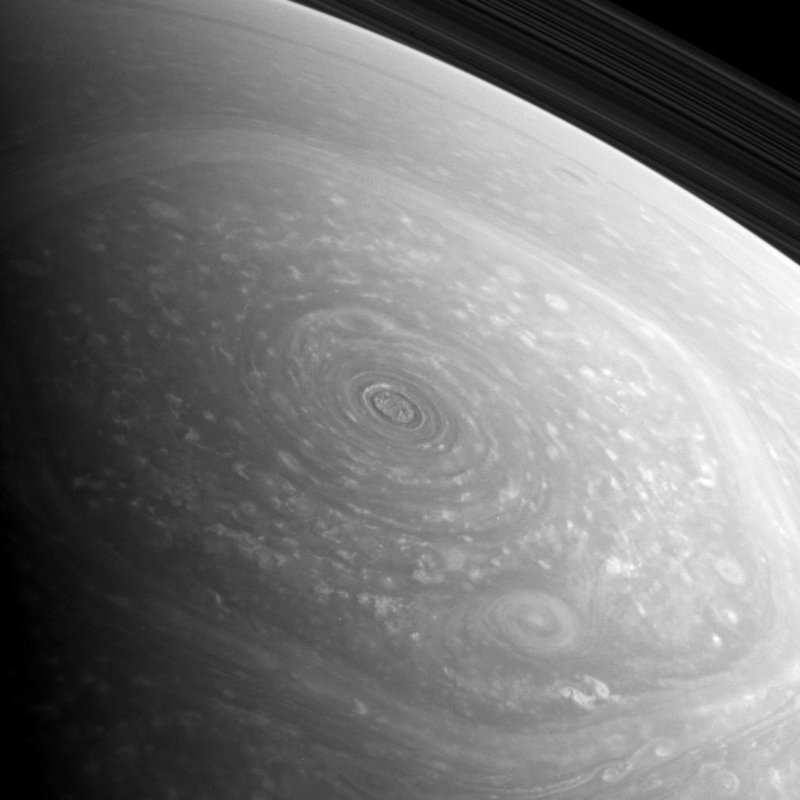 I wonder if there’s some commonality here with this colossal hexagonal vortex at Saturn’s pole? What causes the Jet stream in the north pole and not in the south pole in the first place? Is that tantamount to claiming that Saturn’s external gaseous composition or possibly more solid core is not homogeneous in form and structure? If it were homogeneous throughout the whole planet why do we not see a jet stream created hexagon at the south pole ? Having witnessed a bias of surface anomalies happening in a few celestial bodies in our own solar system at only one of their poles has been giving me doubts for some time now. Amazing, one can discern an almost braid-like pattern in the border Jet Stream(?) of the Hexagon. Image barely hints at it, but video view appears to dramatically reveal it. (Matter of contrasting resolutions, perhaps.) It appears roped-together cloud bands, like spiral-pattern of twisted threads, twined in length of strands. Indicative of secondary circular motion – coiling rotation? What lies beneath the strange carousal panoply of whirling clouds, to form that colossal polar geometry? A surreal formation on round world belted with ocean-gas, streaming below shadows of revolving concentric Rings. Does the vast Ring-System, like giant differential assembly of huge working “machine”, comprised of integrated sets of operating parts (transmitting force and generating current through related [?] Solar-powered motions), play some mysterious role in bending the mighty Northern formation into the dynamic—none circular—Hexagon? Or, does the exotic geometry manifest a none-symmetrical Core in the Vortex display of “surface” atmosphere? Some crystal-like geometry shape? If not projected topography, perhaps, then, line-work of Electromagnetism, through complex-interplay of matter in motion, and energy of force.